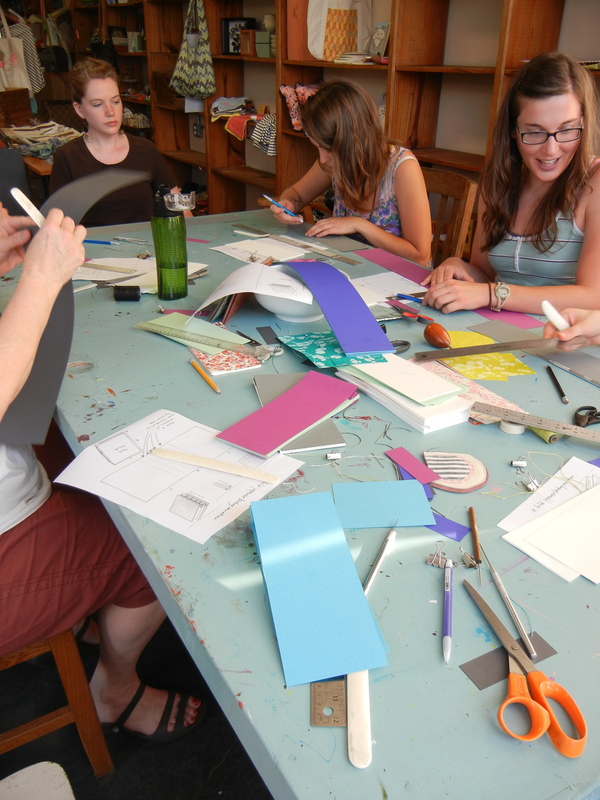 An all-day beginning bookbinding workshop has just been added to the Winter schedule. Registration (via Flying Object) will open in a few days. Details on the Classes page. The past month has been busy, but I’ve hardly taken any fotos and haven’t wanted to blog without them. Sometimes I look back through my recent photographs and realize that I’m spending way too much time inside; more natural light, more vitamin D as the days get shorter, more fresh air: goals for this month! Highlights of October included my first Western Mass session of Beginning Bookbinding, many long days spent in my tiny studio making books for a local craft fair, and preparing for a small edition of screenprints for the holiday season. My past several posts have reflected my focus on making a home in my new location, and I’m happy to report that I’m ready to move forward on that front; that is, I feel at home! Not that every day is amazing or that I’m making millions off of the long hours of book binding, but I do spend far fewer hours missing the mountains (while holding them and my beautiful friends there very dear). Feels like progress, with more (hopefully) to come. Lots of love to all of yous. We made our big move almost two weeks ago, and the time has really been moving fast. 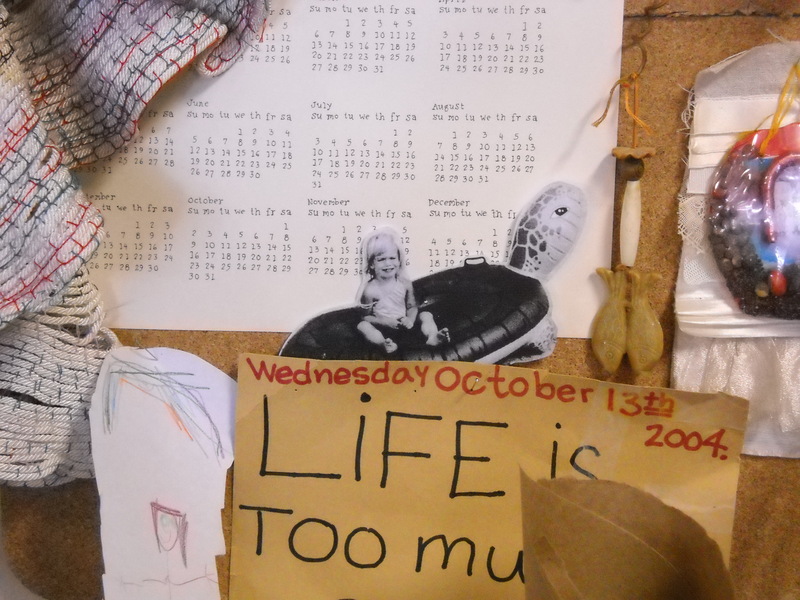 In some ways it seems like we’ve been here for a lot longer- so much has happened already. In the next week or so I want to post some before and after photos of the apartment that we moved into in Northampton. We had only seen pictures of it when we decided to sign the lease, and although it’s turned out for the best, I’m not sure that I’d do that again, or recommend it. It’s a neat little apartment with an unusual layout, and there were a lot of small issues that came up immediately…but more on that later. Other than my insane home-improvement campaign, I’ve been working on trying to get settled in the area, meeting people, and spending a lot of time outside. We live close to downtown and I am really into how flat the roads are here! It’s been great to be back on my bike after a long hiatus in the mountains. A few days ago Andy and I rode to Amherst on a neat bike path that goes over the river and past lots of pretty farms. Last night I saw lots of meteors from a blanket in the back yard, and I love that the weather has been cooling down at night. 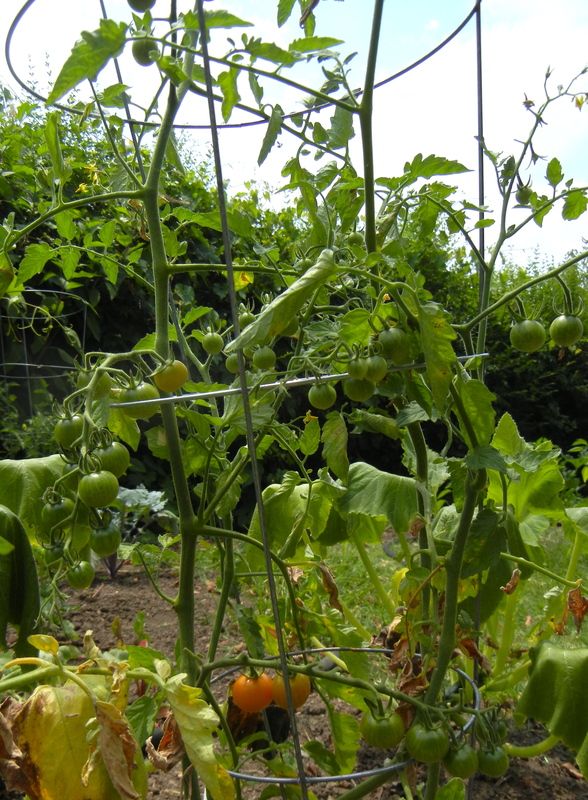 The things I’ve been missing about Asheville are the abundance of local food at restaurants and the farmer’s markets, running into friends all the time, the narrow streets (somehow the roads feel so open and exposed here at times), and our old garden. Overall I am really enjoying experiencing life in the Northeast. We are planning a quick trip to Maine for some time in the next week, and I spent the weekend with my dear friend Emily in Providence, where we made the best blackberry peach pie ever, ate Indian food like I haven’t had in years, and danced funny dances to some really bad hip hop. 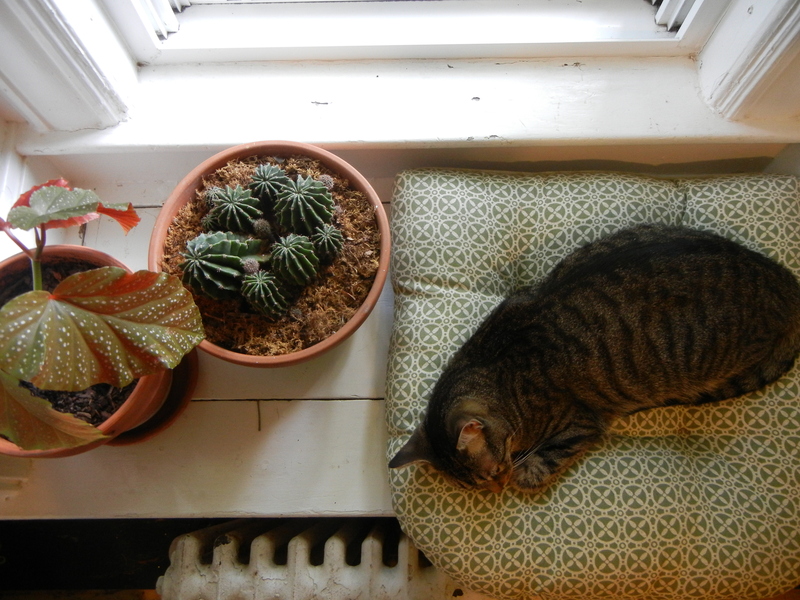 I’ll be blogging more often now that my studio is finally unpacked and my home is finally starting to feel like my own. Stay tuned for photos of our new place and our going-away party in Asheville, during which I really saw how wonderful and full of beautiful people my life is. The past few weeks have been full of all sorts of fun and busy times, and lots of summery happenings. A dear old friend of ten years came to visit us on her Outer-Banks-to-Tennessee bike tour (shoulda seen her legs…all muscle! ), and more visitors a few days ago as well: much-loved friends on their way back up to their New York homestead, which, with its goats, chickens, horse, and more, sounds like a dream I’d like to live in a few years down the road. My sister is coming down to visit in a few days, and since she’s eager for relief from city craziness and inescapable heat, I’m excited to take her swimming and berry-picking. One of the things I’m currently looking forward to about our move is the proximity of so many beautiful places to visit, combined with a little bit of much-needed free time, so that Andy and I can have some summer travels of our own. The next month will be packed, but with special times and beautiful people. I’m hoping to have a gathering of friends before we leave town, and it will be nice to have so many people I love in one place for a few hours. I’m also looking forward to the Big Crafty next weekend. I moved out of my studio space this weekend, so for now our sunroom is also a temporary work space, and I’m excited to be able to spend more time at home working on creative projects. I’ll be working on a neat custom wedding book, finishing up lots of books for next weekend, and altering lots of clothes so that I can feel like I have a new summer wardrobe (theme of the week is minimal-but-work-appropriate clothing). 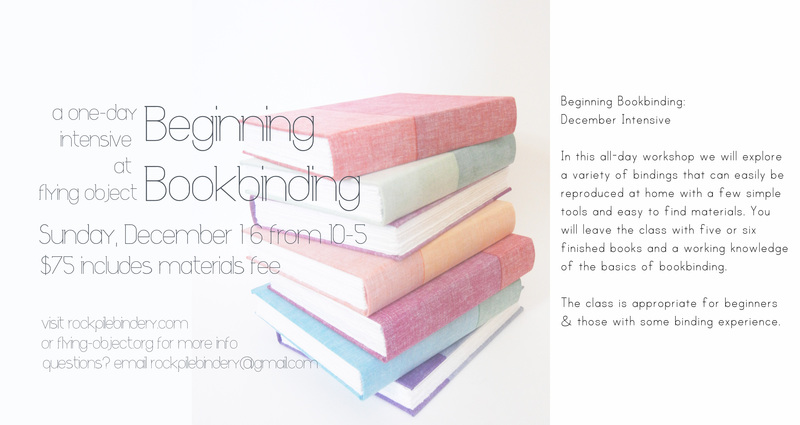 One of the loveliest parts of my life as of late has been teaching my beginning bookbinding classes. The June sessions were wonderful, and I am convinced that I have the most amazing and enthusiastic students in town (thanks to all of you for making my work so much fun)! In the past, I’d hear the term DIY and an image of a haphazard, clumsily made object would come to mind. But these days the concept of Do It Yourself has a completely different implication. (As proof of this, google images of “DIY” and see what comes up- the DIYs of today are neat, and innovative, and well made!) I like the Do It Yourself trend, and have, in fact, embraced it myself in my own bookbinding practice. As I’ve said here before, I embraced the craft of bookbinding because I could DIMyself at home, and I love teaching students all the ways that they, too, can make books at home. Got a few bricks, a flower press, a bone folder, a clothesline and some PVA glue? 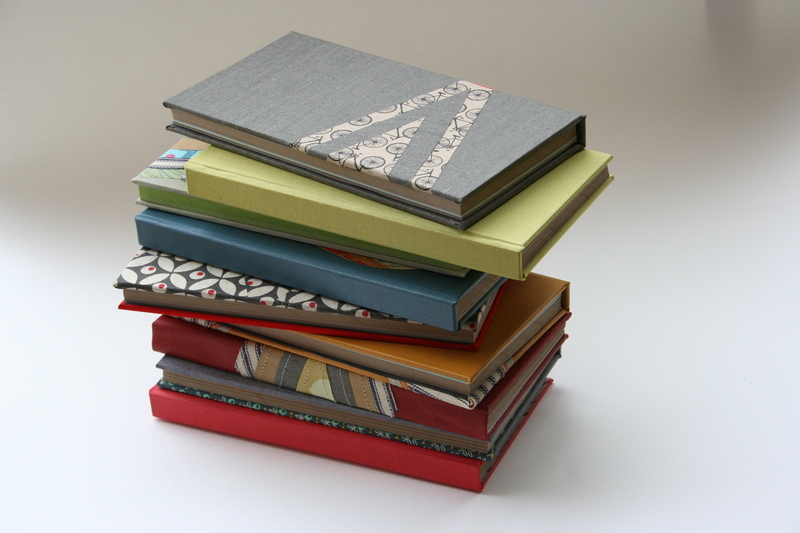 You can make a beautiful book for yourself or someone you love. 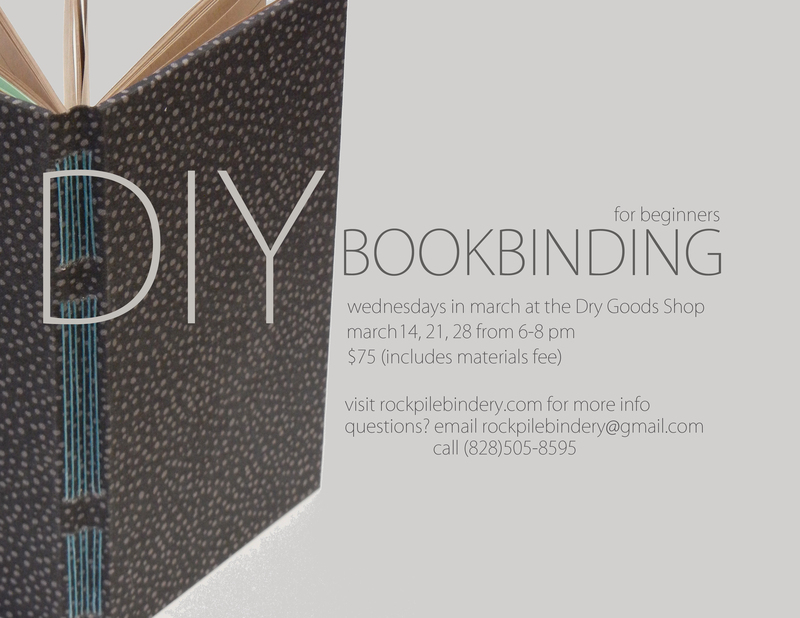 Add a neighborhood copy shop to the mix and your bookbinding potential expands. In that spirit, I’m offering a new class in March! In the class we will explore a handful of bindings that can easily be reproduced at home with a few simple tools and easy to find materials. We will also learn techniques that work well with recycled and found materials. Once again I am offering the option of work-trade for part of the class fee. 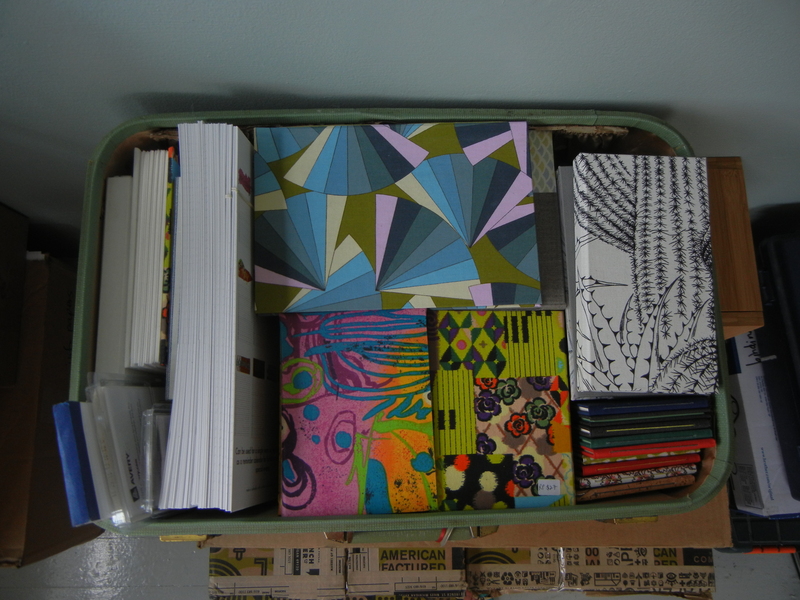 Let me know if you’d like to help me with basic binding jobs in my studio for a partial discount. Can you believe that it’s already January? For me, the holidays felt less like a time to relax and spend time with the people I love than a constant, never-ending to-do list. So January feels nice and slow, and a good time to get reoriented with my goals and plans for the year ahead. 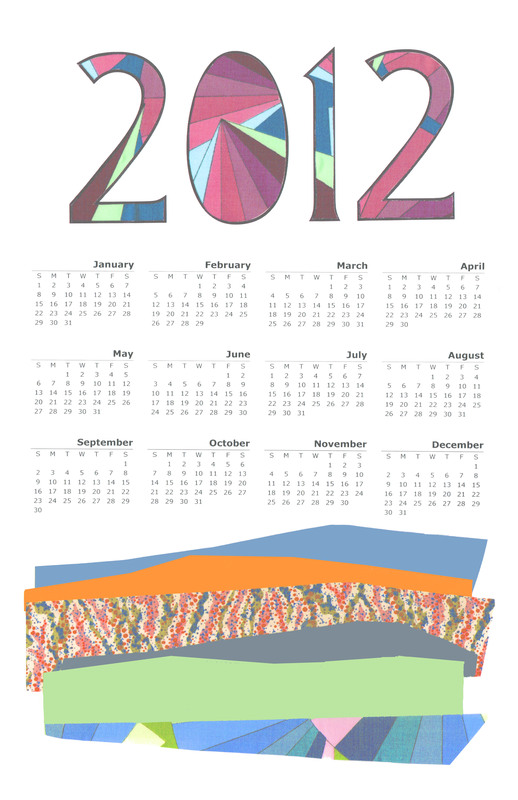 As it’s looking now, 2012 will hold multi-faceted changes for my life, and I am looking forward to seeing where I end up. 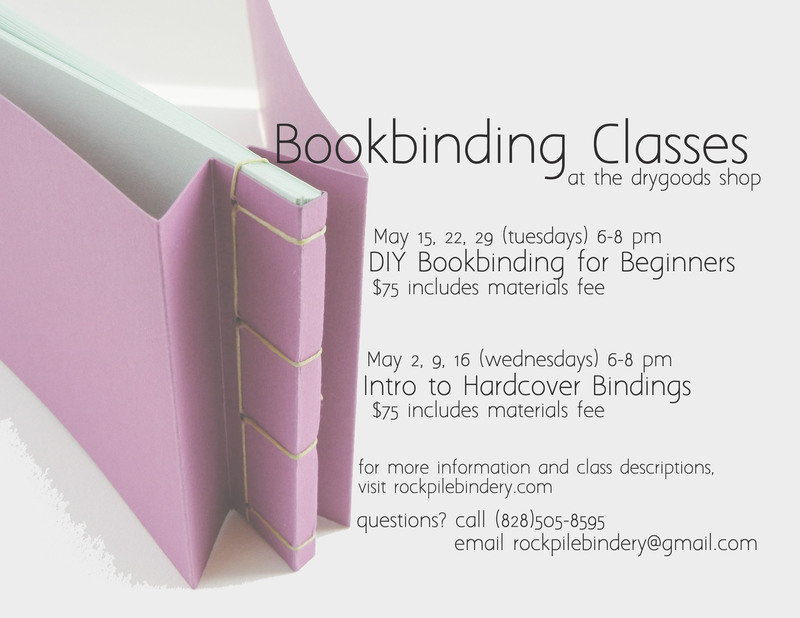 Rockpile takes a bit of a little break in the new year to unwind after the holidays, but I am planning a few bookbinding classes for the winter and spring, and I’d love to hear from you if you have any requests for class options. Also, email me if you’d like to be on my mailing list. I’ll send out an email with class info and other news. Thanks to everyone who helped to make this holiday season fun and successful for Rockpile. Hope that everyone is enjoying the newness and insight that come with the turning of a new year! Yesterday afternoon, in a burst of inspiration, I made a list for March and all of the little projects on which I plan to embark this month. I’ll share them as I make them, one by one, with you, my friends.